La Posta Foundation is a non-profit, cultural, which focuses its activities on research and dissemination of contemporary art, particularly one that is based on electronic files, including video, photography and multimedia. It operates with the support of independent sponsors. But anyone can help us further develop our work, a task-oriented community service. 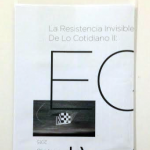 For your help you will receive a welcome gift consisting of a copy of the booklet-poster published on the occasion of the exhibition “The Invisible Resistance of Everyday Life II: Equivoque“.